Diggers Valley: 17 December 2016. The week beginning the 17th of December 2016. A copper injection for these 14 cows today. This treatment is the fourth for this calendar year. My intention has been to give them three through the autumn/winter period and one before mating, which keeps their levels above deficiency. Last year most of the herd only got two shots, and there were consequences! 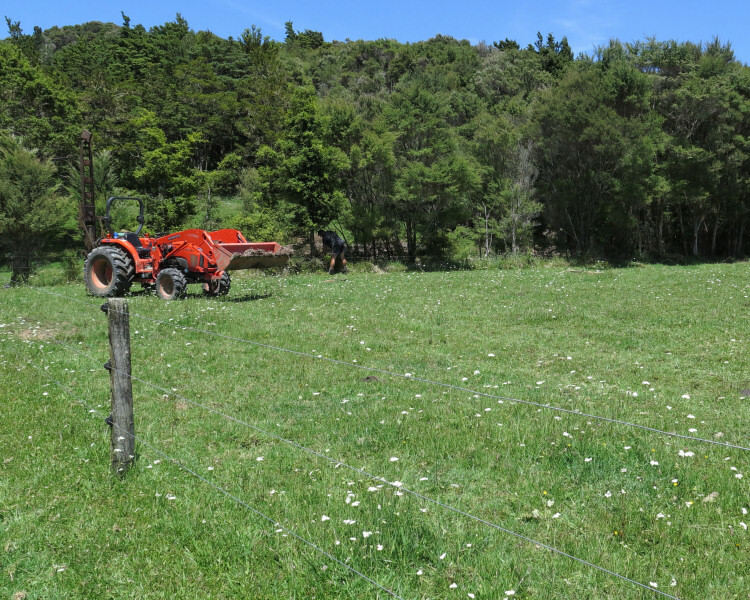 Stephan renovated the bit of electric fence in the corner of Flat 5b, straightening the leaning corner strainer post, then removed two of the five wires, rebuilding it as a three-wire fence, which is all we really need where we are not farming sheep. Jacob's mother phoned and said she was coming north again to return a trailer and sort out a few loose ends after their move and if we were happy to have him, Jacob would really like to come and see us for one more last time. Of course we said yes. Jacob had another go at milking Zella. These days everyone who milks wears gloves, for Zella's protection, since she has been so prone to mastitis. 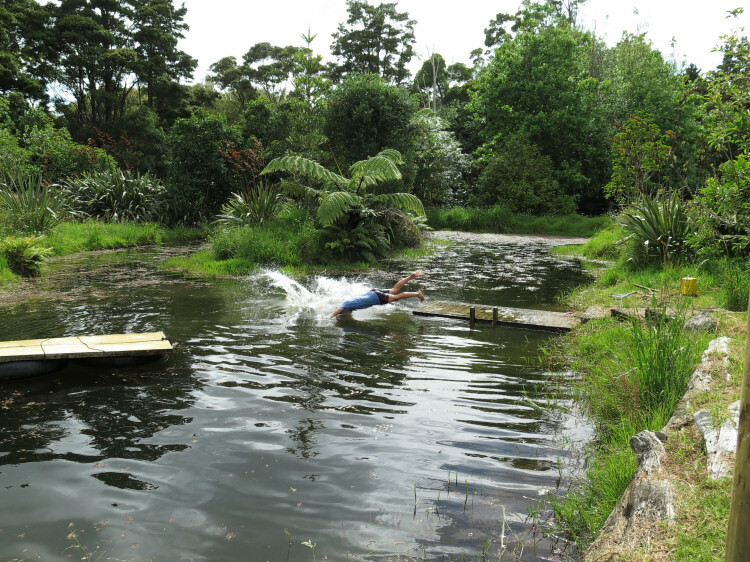 Jacob's mother came to collect him and we sat and watched Jacob and Stephan swimming in the pond for a while before they went on their way. Stephan made Mushroom 1 look lawn-like during the afternoon. 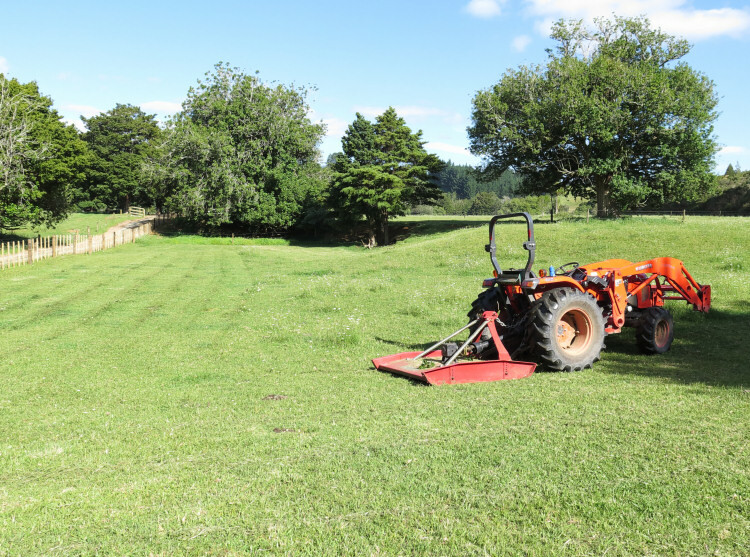 It's very satisfying being able to exercise this extra level of control over the summer pastures. 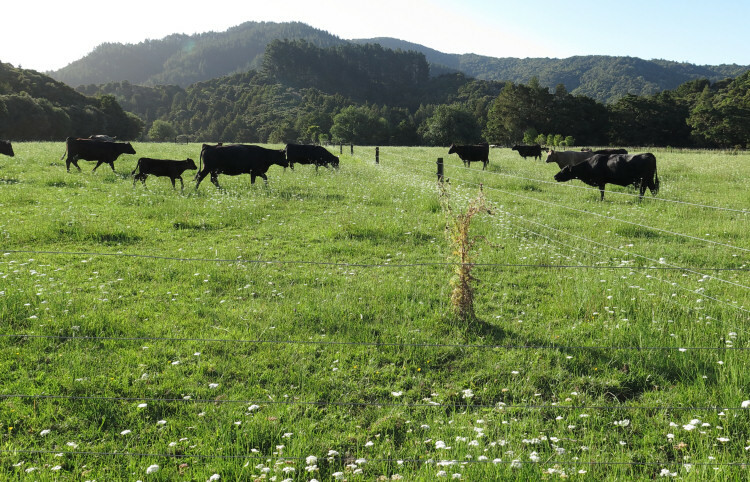 We're making better grass for the cows the next time around. 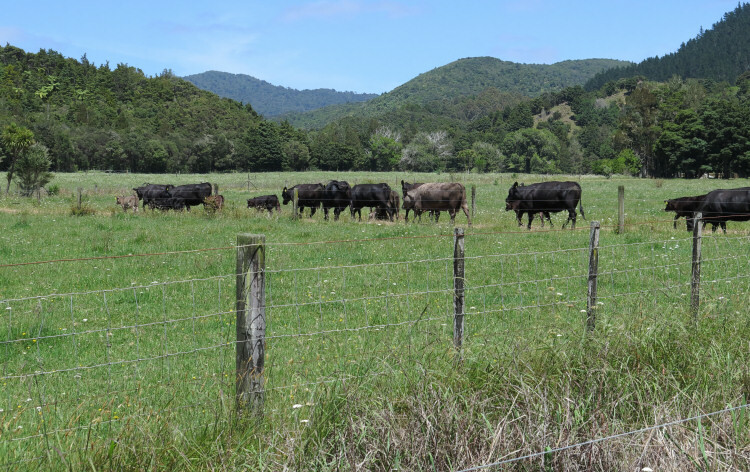 I coppered the second mob of 14 cows with calves, then put them into Flat 5a on the right. When I shifted the other mob of 14 pairs into 5b on the left there was a lot of posturing and snorting, as usual. They can get used to each other overnight before I mix them tomorrow. 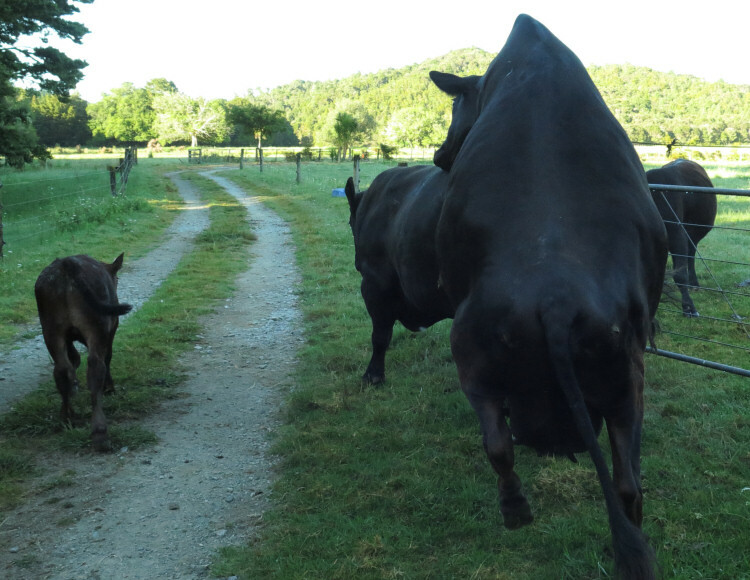 Mr Big was standing down by the Flat 1 gate as the third cow/calf mob went past. 710 was on heat and when a bull sees mounting activity amongst the cows, he wants to be there doing the job! 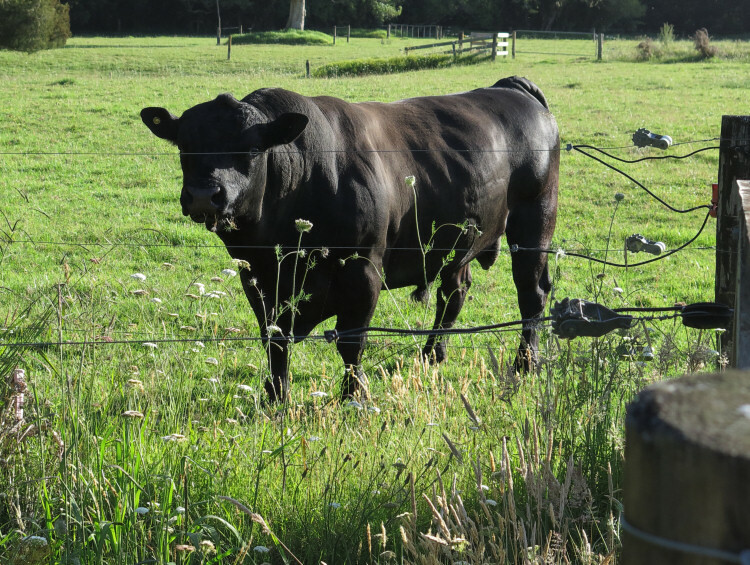 This bull has a horrible tail setting: his tail sort of juts up from the end of his spine. I can see it coming through in some of his calves but I don't consider it more important than his good temperament and other good traits. At 7pm I had the nine cows and calves in the yards for the cows' copper injection. 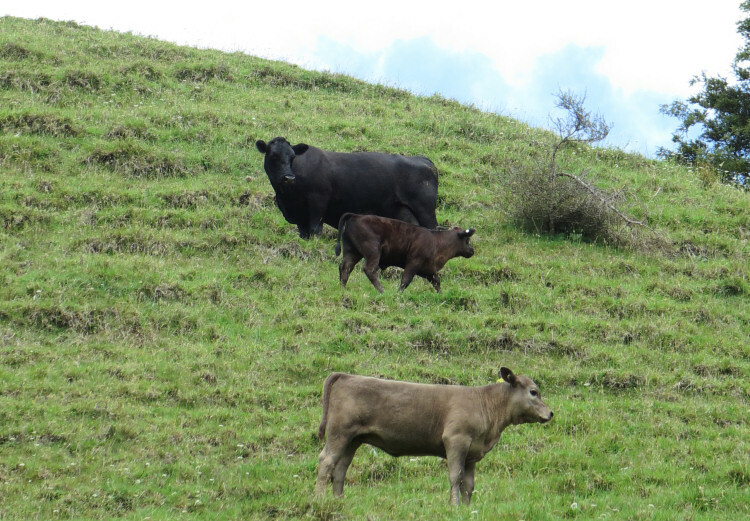 The calf in the middle of the picture is Henrietta 141's daughter, 167, the calf who nearly died. The hair has grown back where she went bald as a result of having a wet, scoury rear when she was sick. What a uniformly coloured group. I'll have to dig out some of the early printed photos and scan them for comparison. There used to be so many colours in our cattle. I combined the two 14-pair mobs today, from the two paddocks here in the foreground, through the gateway into 5c. Having spent the night near each other, most of them put their heads down and grazed the newly-offered grass. 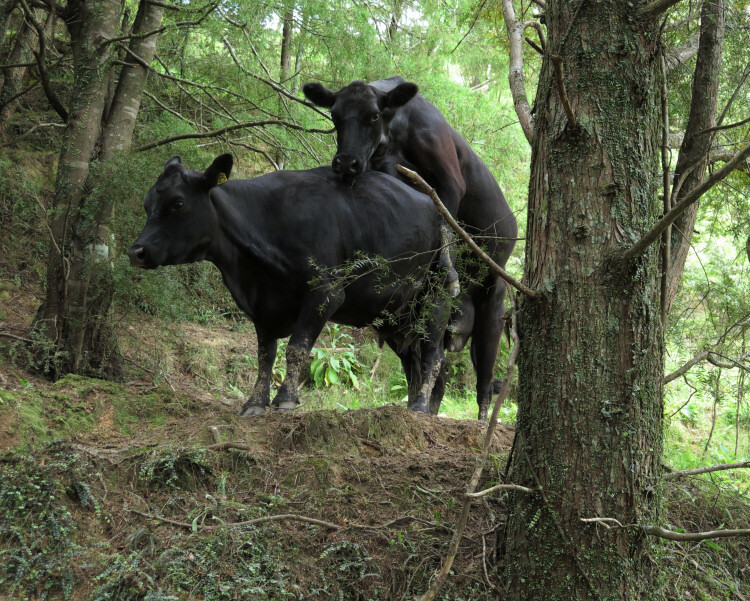 The two calves visible to the right, are part of the the nine-pair mob in 5d. I won't put them all together just yet, until I've given the 28 calves their booster vaccinations which are due from today. 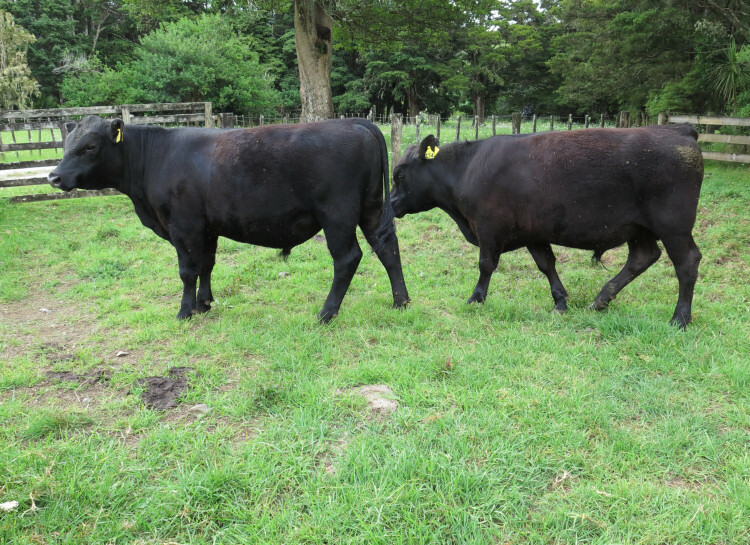 The two yearling bulls, 151 and 154, in the yards for their copper injections. It looks like there is probably a bit of coccidiosis about, as usual. 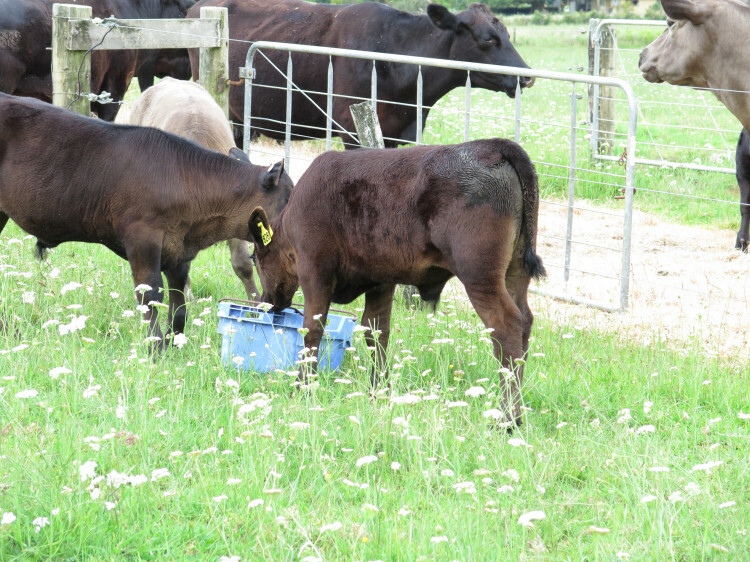 Many of the calves go through a phase of scours, which this year didn't turn into anything more serious and nobody seemed sick with it, just irritated and uncomfortable for a couple of days. They get over it, usually fairly quickly, develop useful immunity to the bug which then protects them for the rest of their lives. 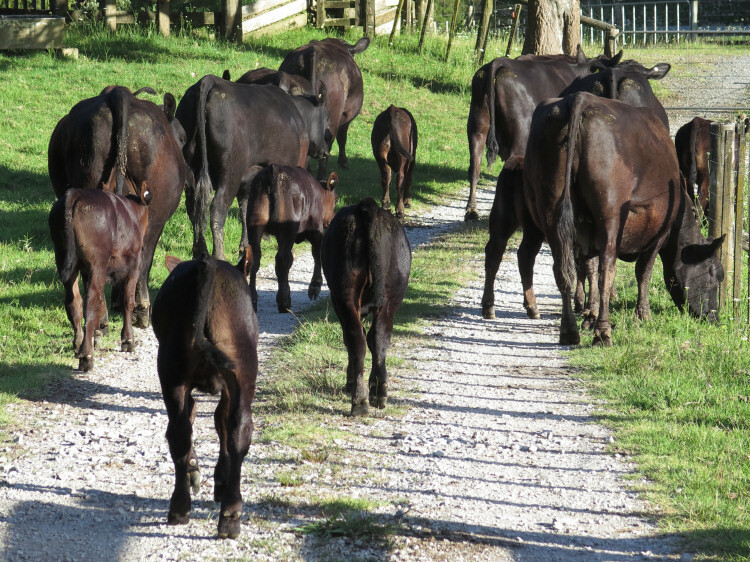 We took the 28 calves and their mothers to the yards to give the calves their booster 7in1 vaccine this afternoon. 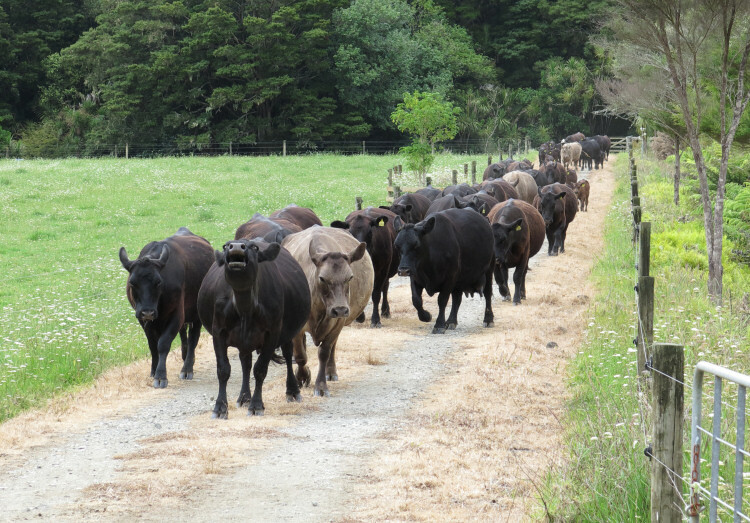 Here they are all walking back to the Windmill Paddock, where I had already put the mob of nine cows and calves, so they can move around as one mob from now until mating time. In the evening, after they'd had time to sort out any necessary social readjustments, we put them all Over the Road. It looks like I was wrong last week when I thought Zella was coming on heat. We were away all that day so didn't see what happened after the bull's early-morning interest in her. This morning Zella was very interested in the bull. This time she really was on heat. 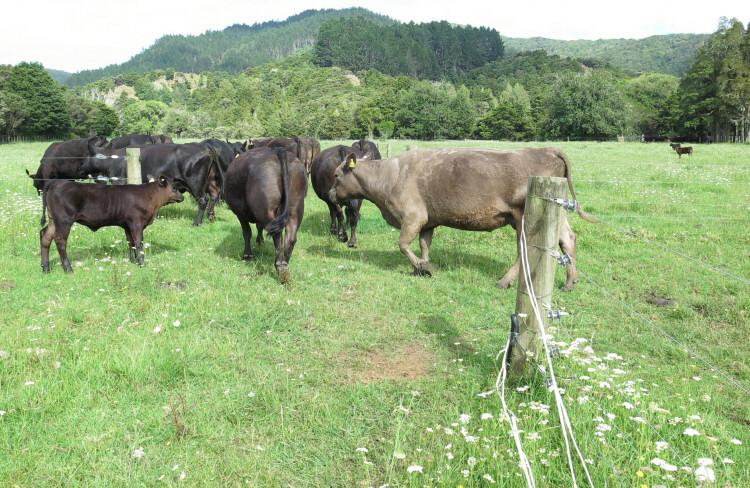 I find it so interesting watching the cows recognising their calves amongst all the other, seemingly similar, calves. I couldn't see the tag on the calf walking along the hillside but Jet certainly knew who she was. Dexie 101, mounting 725; both are on heat. It's always good when the cows are coming on heat before the mating period begins, hopefully meaning most of them will have returned to oestrus in time to get pregnant in the first three week cycle. The calves of these two were hungry and calling in the late afternoon, their mothers having been too busy with each other to stop and care for their babies. In that ridiculous way people seem to do, I decided I should get the overdue annual accounts done before the end of the year, which in this hemisphere, really means getting them done before Christmas, since everything then shuts down over the next couple of weeks for the main part of the summer holidays. It was an insane plan, since there's always so much of everything else to do, mostly things of higher priority in terms of the season. Eventually, on Friday sometime, I gave up, packed all the paperwork away and got on with more sensible tasks, like preparing the house for the summer onslaught of visitors. Jude and Roger and the children are coming here for Christmas and Jude's request is for all the Christmas treats, including fruit mince pies and steamed pudding. 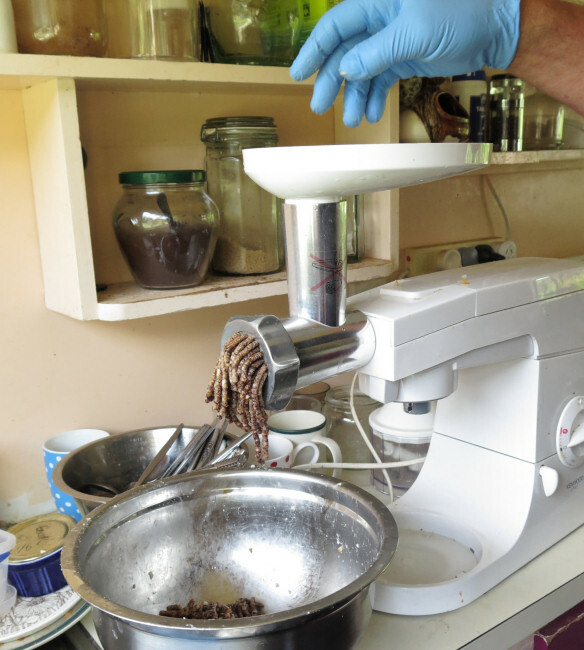 Stephan spent today making the fruit mince, with the real suet from our last beast.